For rectilinear walls, stairs, and other shapes, SketchUp’s Rectangle and Push/Pull tools are rock stars. Rounded forms (such as concrete patios and castle turrets) and irregular lines (such as riverbeds and Frank Gehry buildings) call for other, more drastic measures. Dive into the component that contains the imported CAD linework. By “dive into,” this means you need to edit it, which you can do by double-clicking it with the Select tool. Select the edges you want to reuse. Make a group out of the edges. Choose Edit → Make Group to do this. Grouping your selection accomplishes two things: Grouping makes reselecting it easier (in case things go awry), and it keeps things nice and separate for the next couple of steps. Stop editing the CAD linework component. You can exit a component (or a group) by double-clicking with the Select tool somewhere outside its bounding box. Choose Edit → Paste in Place. Voilà! The edges in question are now a part of your model, and (thanks to Step 3) are quarantined from the rest of your geometry by means of a group. For shapes that are made up of simple arcs (segments of circles), your best bet is to try to re-create them by using SketchUp’s own Arc tools. Why not just use the Paste in Place method (described in the preceding steps) to copy them? For arcs, it’s nice to have control over their number of sides, and drawing them from scratch is the only way to do that. Draw an edge that’s perpendicular to one of the arc’s line segments, heading in the direction of the arc’s center point. You can use SketchUp’s Perpendicular linear inference to help you draw a perpendicular edge. This is the first step in figuring out the precise location of the arc’s center point. Repeat Step 1 for another of the arc’s line segments, crossing your new edge over the one you just drew. The point at which these two edges intersect is the center point. Erase two of the edges that you just drew, leaving a small V that points to the arc’s center point. Look at the third image to see these edges. Choose Draw → Arcs → Arc to activate the Arc tool. What is now called 2 Point Arc used to be SketchUp’s only Arc tool; it works by first setting endpoints and then setting a bulge. The new(ish) Arc tool, which is called simply Arc, lets you start by defining a center point; this is much more useful for situations like the one you’re in now. If you have SketchUp 2014 or later, you have this new Arc tool. Click once to set the center point of your new arc. This is, of course, at the tip of the V you drew in Step 3. Complete the arc by clicking to set each of its endpoints. (Optional) Change the number of edge segments in your new arc. Before you move onto anything else, type the number of segments you want, followed by the letter s, and then press Enter. Most likely, you want more than the default 12 segments on arcs that represent major features in your design. 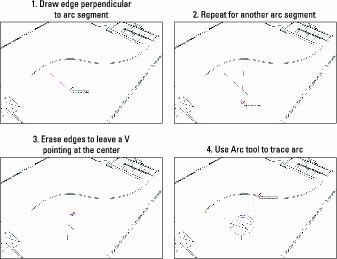 The Arc tool lets you easily draw arcs with a given radius.